Pin It Even with all of the water and great scenic views in Austin, we cannot offer views of snow-capped mountains in "wedding white" like you can find in June in Snowmass. The Snowmass Club has a gorgeous "Alpine Meadow" with views of Mt. Daly and the Elk Mountain Range and can seat up to 350 people. It's separated from a smaller lawn by a babbling brook and still only steps away from the Sage Restaurant. We had the opportunity to dine al fresco for dinner on the 4,000 square foot Sage Patio overlooking the pools, waterfall, and Mt. Daly. We enjoyed chicken tortilla soup or watermelon gazpacho, our choice of Alaskan halibut, buffalo cowboy steak, or butternut squash ravioli, and miniature desserts. (Their plated dinner entrees for groups start at only $24/person.) 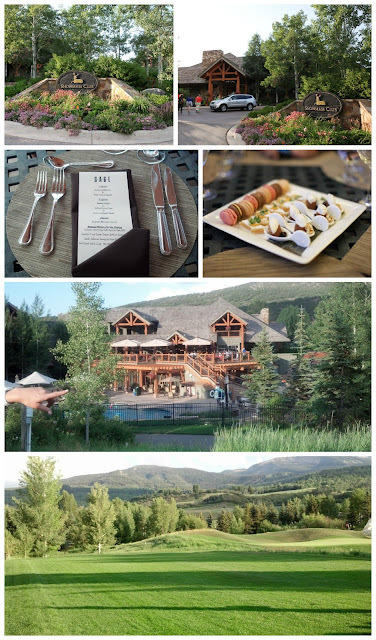 Even though it was July, the weather was fabulous, the food was wonderful, and the scenery was truly majestic. They do require that you have a wedding coordinator, so call or e-mail Your Very Own Fairy Godmother!